Some men feel that carrying a wallet that holds several gift cards, receipts, credit cards, cash, and ATM slips is too much work. Thankfully, you have an appealing alternative that involves the use of a leather money clip wallet– an accessory you can carry around unnoticed in your breast pocket or pants pockets, thanks to the slim design. An elegant piece of leather money clip wallet like Kinzd presents you with a fantastic alternative for carrying cash, due to its minimalist design, sense of style, and ease of use. Below is a useful guide that helps you to get the most from a stylish money clip wallet and the options available today. Once you’ve learnt how to get the most from money clips, you’ll find them highly convenient for managing cash. To begin with, collect all paper bills and credit cards. Destroy all expired credit cards and consider throwing away empty gift cards that you might have to prevent you from carrying unnecessary weight. The clips are minimalist, therefore, if you prefer to haul a lot of items in your pocket, then you’ll be better off with a clip card holder or a wallet. With most of the aforementioned clips, you fold paper currency in half and held together using the clip. Other forms of money clip wallets incorporate a card holder with pockets for holding several cards. Once your cash and cards are secured safely in your wallet with the money clip, you can carry it wherever you go. For convenience, place larger bills at the bottom, while ensuring the smaller ones remain at the top. This allows you to pull out smaller bills easier from the middle of the stack thus making it a more convenient way to make daily purchases. Remember, the folded part should go in first as you slide a stash of cash into the money clip. The clips are strong enough to securely hold the cash in place. If you’re using a money clip that incorporates a cardholder, then you can slip in items such as your ID, credit card and a debit card. 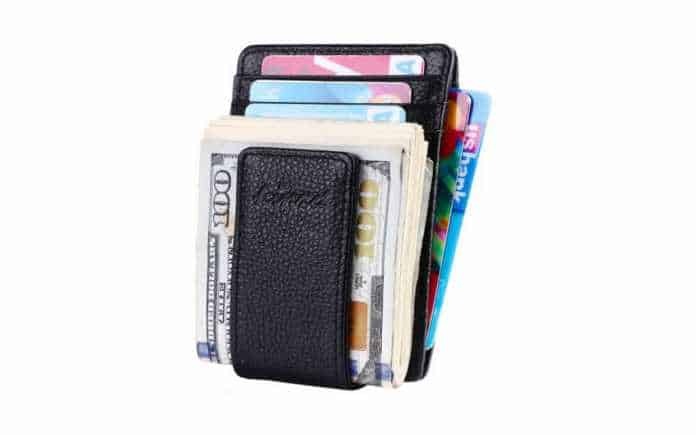 When it comes to carrying leather money clip wallet, you have options regarding where you wish to carry it that you need to consider. The clip is easier to access when placed in the front pant pockets. You can place your clip opposite the one that carries your phone. You can also place your money clip wallet conveniently in your rear pockets. You may also carry the clip in your jacket or coat breast pockets. With a bit of practice, it shouldn’t take you too long to master how to slide or pull out individual paper bills from your clip. If you arrange the cash or cards in order, it will be easy for you to pull out these items without necessarily removing the entire money clip. Even so, you can still remove the entire clip and look through your bills and cards as needed. a. The stiff money clip wallet– The most ideal and function men’s accessories with the simplest of designs. Are available in a variety of shapes and cool designs. While they might look simple, the clips are elegant pieces of accessories you carry around in your pockets. b. Clip Card Holder – These come with attached leather pockets, thereby allowing you to carry things such as your ID and credit cards. Unlike other money clip designs, the clip card holder comes with ample storage that comes in handy when you need to carry several cards. c. Double Money Clips – These have at least two metal clips. The second storage is helpful for holding everyday cash. The first clip works in a similar manner as the second clip and allows for simultaneous operation. d. Material – Money clips are produced using a broad range of material options including leather such as Top Grain, Italian, Synthetic, Napa or other types of skins (Stingray or Eel), or magnets, metal, and many more. e. RFID Protection – Clip wallets that integrate RFID Protection guard against digital theft. RFID clips safeguard sensitive info by keeping it out of the hands of digital ID thieves. Why should every guy carry a leather money clip wallet? It is the perfect cure for your bulky wallet. With money clips, you can choose or narrow down items (ID and credit cards) by determining which ones are most important to carry. While it can’t replace the traditional wallet completely, you can comfortably use one when you need to carry a lighter load.